Having grown to category 5, Hurricane Irma continues to travel northwest of the US territory at a speed of 175 miles per hour and with winds of up to 215 miles. It began as a classic Cape Verde storm - coming from the islands off the west coast of Africa - and is the result of "puffs of unstable, stormy air moving westward", feeding off the warm waters of the Atlantic. Some of these storms disappear along the way, and others take power and become hurricanes, as in the case of Katia, which originated in front of Mexico. Currently, there is another storm crossing the Atlantic and that observers have named Jose, who is expected, will follow in the footsteps of Irma. According to the Washington Hispanic, the Atlantic hurricane season begins on June 1 and usually ends on November 30. They debut at a time when ocean water is warm enough - a minimum of 26 degrees Celsius - reaching its peak by mid-August. During May, the US weather service predicted a 70 percent chance of 11 to 17 named storms, and five of nine of them would turn into hurricanes. Currently, three of them threaten the safety of populations in the Caribbean Sea, especially in the case of Irma, whose trajectory has been fed by the warm and deep waters of the sea. This is the second time in 40 years that a storm has reached winds of 297 miles per hour in more than 24 hours, after the huge typhoon Haiyan, which in 2013 killed more than 6,000 people in the Philippines. On Wednesday, the British and Virgin Islands experienced strong winds and the heart of Hurricane Irma is currently north of Hispaniola, but heavy rains have been reported in Haiti and the Dominican Republic. In the next few hours wind gusts of up to 70 miles are expected to cross Hispaniola, and heavy floods and landslides are also expected. 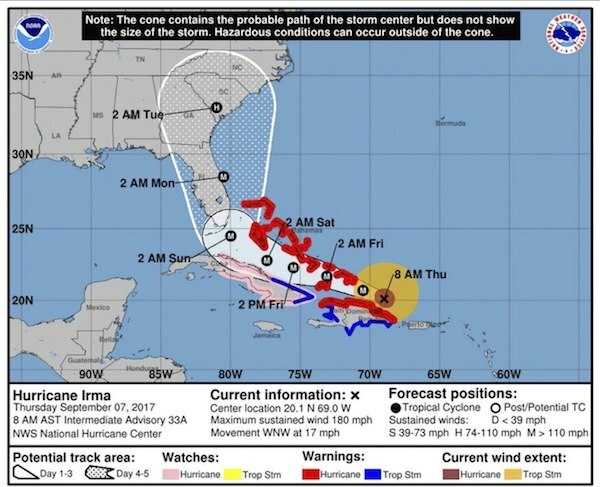 Meteorological watch centers have also reported great concern for the Turks and Caicos islands, as the eye of Hurricane Irma is less than 10 hours away from touching land on the island of Grand Turk. The hurricane will pass through the island nation tonight and near the south of the Bahamas on Friday. The Great Inagua will be the first island in the Bahamas to be impacted by the hurricane - still in category 5 - and large and catastrophic ravages are expected, with a storm of up to 20 feet high. Also, the weather service predicts that Irma will start reaching South Florida late Saturday and will continue north for the next 24 hours. Following in its footsteps, Jose has strengthened to become a hurricane, only 700 miles from the Leeward Islands, which were already beaten by Irma on Wednesday. This new hurricane will drift northward and will continue to strengthen in its path. According to the National Weather Service, storm Katia also began to form on Wednesday and received its name, as is customary, reaching winds of 39 miles per hour in the southwest of the Gulf of Mexico. Katia is expected to touch land on Friday in the state of Veracruz, with heavy rains that will last throughout the weekend. This is the second time a trio of storms threatens the Atlantic. The last time it happened was in 2010, when simultaneously appeared the hurricanes Igor, Julia and Karl. Since the beginning of satellite observation of meteorological phenomena - 40 years ago - scientists have taken time to analyze the origin and the factors that cause these storms. According to The Independent, storms are not caused by climate change, but warming of the waters, which are its main fuel, could indeed be caused by human impact in nature. “Hurricane Irma, following so closely after Tropical Storm Harvey and other extreme weather emergencies, has prompted questions about the role of climate change." said Dann Mitchell, NERC Research Fellow at the University of Bristol’s Cabot Institute. "The question of whether climate change 'caused' any particular weather event is the wrong one; instead, we must probe how climate change alters extreme weather. Aside from the warming atmosphere, rising sea level and surface ocean warming have likely contributed to the impact of both Irma and Harvey."